A strong if familiar set of additions to a classy 4X game. Influenced by Reviewed on Intel i7, Nvidia GTX 970, Windows 7 64, 8GB RAM, normal HDD. Reviewed on Intel i7, Nvidia GTX 970, Windows 7 64, 8GB RAM, normal HDD. The 4X genre hadn’t been shaken up since GalCiv—then Endless Legend came along. We gave it 89% back in October, praising its art, diverse factions and innovative narratives, and only holding it back from golden accolades because of its weak AI, lack of tutorials and tedious (but avoidable) combat engine. Guardians is its first, small, expansion. It focuses on Guardians, wonders and events. The titular Guardians themselves are like Total War: Shogun II’s late game ironclads—huge, tough units that can take out entire armies by themselves. Giant elementals aren’t exactly in line with Amplitude’s usual innovative design—they’ve cropped up in games regularly from WoW’s Ragnaros to Demigod’s Rook—and their place in the Endless mythos seems questionable. But you can’t fault Amplitude’s design team, who’ve put a fresh spin on each of them—Fotios, the Flame Guardian, for example, is a one-armed stone titan leaking a lash of flame from his missing left arm. Once you get to the third research tree, the first of the elementals becomes available. There are five all told and they each have a different array of powers, beyond their enormous health and damage. For example Skoros, the Dust Guardian, is the first available and is classified as a support unit, so has the ability to heal entire allied armies as well as mind control his foes in battle—he’s certainly the weakest of the Guardians. Fotios the Fire Guardian by contrast is very much a front-line fighter, burning anything that comes near him in battle for severe damage. The other three titans are equally specialised. Gios, the Earth Guardian, can fortify cities and attack with a devastating earthquake. Neros of the Water can ride rivers, and charge at enemies with the force of a tsunami. And the weirdest, Atmos the Air Guardian, is a flying creature that can teleport and summon a freezing wind. It’s questionable whether they’re worth building though; in the amount of time it takes to research each one then create it, you could build many city improvements and several other units. And a well-equipped, hero-led army can still take one of these things down. They’re not all there is to the expansion though. The research pane now has a new element on the lefthand side of each era’s tree, featuring two legendary deeds and one legendary building. The deeds are all competitive quests which track how each player is doing on certain metrics—defeating armies, say, or collecting rare materials—and rewards the first to a mark with an item, a huge pile of resources or an empire-wide buff. Similarly, open world competitive and cooperative quests have been introduced, which challenge the players to perform a task before any of the others or alongside the others, such as wiping out plague-riddled but buffed minor faction units in a given region. Like the existing quest system, it’s an attempt by Amplitude to encourage you to deviate from your comfort zone. In multiplayer, it adds extra points of interaction as other players just pip you to the reward. 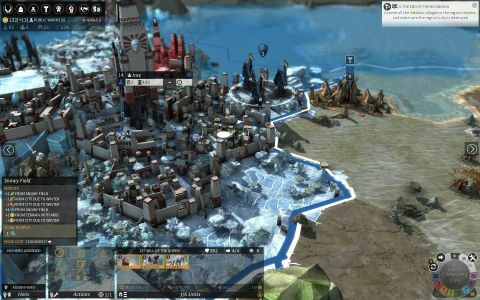 The five legendary buildings are Endless Legend’s equivalent of Civilization’s wonders. Like wonders, they appear on the map as they’re so huge. Each of them boosts multiple city attributes, which are further boosted if the district is levelled up (when surrounded by boroughs). There are also ten unique buildings, which you’re only allowed to build once per empire. It’s sad that there aren’t any faction-specific buildings yet and the number of legendary buildings is rather tiny considering there’s only one per age, but this is a nice if small addition, especially for multiplayer. Finally, random events have also been introduced that shift the parameters of the world. For example, for ten turns sea tiles might become hugely more productive. These are like minor version of the game’s existing season mechanic and are really more to do with colour than any mechanics you can take advantage of or rely on.. I have to emphasise this, though; all of these additions come with Amplitude’s unparalleled artistic design and absolute golden narrative. This was the best written game on PC last year for me, with its elegant flavour text and divergent factional quests really driving you to play on, and complete the game with every faction. Well, it drove me anyway. Though this expansion is small and inexpensive, it fits perfectly into Endless Legend, filling in gaps and extending concepts. It’s a mite uninspired—as we said giants and wonders aren’t exactly alien to 4X games—and it doesn’t fix the bigger problems with the game—that underwhelming combat—but it certainly guards against anyone stealing the 4X crown, for the time being.